My family and I just saw Coraline in 3D at our local cinema – it was absolutely fantastic. (Yes, it’s reached Europe at last!). The sound was great; no interruptions; totally immersive and escapist. It wouldn’t have been half the experience on TV. That got me thinking about screens: big and small. Apart from our wrist-watch (maybe another blog post!) the smallest screen most of us regularly look at is our mobile phone (=cellphone). Apparently 7 out of 10 people now sleep next to their mobile phone (not sure how many of these phones are turned on). It is generally (although not universally) agreed that the telephone was invented by Alexander Graham Bell. He was awarded the first U.S. patent for the telephone in 1876. The Bell Telephone Company was created in 1877, and by 1886, over 150,000 people in the U.S. owned telephones. In 1879, the Bell company acquired Thomas Edison’s patents for the carbon microphone from Western Union. This made the telephone practical for long distances; it was no longer necessary to shout to be heard on the receiving telephone. It’s hard for us to imagine today what a change in people’s lives that was: to actually hear someone’s voice when they were physically many miles away. Bell envisaged that the telephone would be used for important things (like fire alarms or by Heads of State to discuss whether they should go to war or not) rather than for trivial chatter. But hey, you can’t win ‘em all. But that was of course only the beginning. Today we have the iPhone: Touch screen, Voice, Music, SMS, Mobile Internet plus upwards of 30,000 apps. To mis-quote Fatboy Slim (and before him Virginia Slims cigarettes) in terms of telephony, “We’ve come a long way baby“. Today there are 1.3 billion fixed landline phones in the world. 950 million mobile phones were sold last year alone. There are an estimated 4.1bn mobile phone subscriptions. It is estimated that 74% of all mobile phone subscribers send and receive text messages on their phones. There are more mobile phones than registered automobiles in the world today. Not only is the growth of mobiles changing society in developed countries, but it is also dramatically changing the lives of people in developing countries. For instance in Kenya 1 in 3 adults owns a mobile device. Within the next 5 to 10 years it is predicted that as much as 90% of the Earth’s population will be actively using mobiles. (you can skip this bit if you don’t find it as fascinating as I do). The first mobile ‘phones arrived in the early 80s and were the size of a large brick. 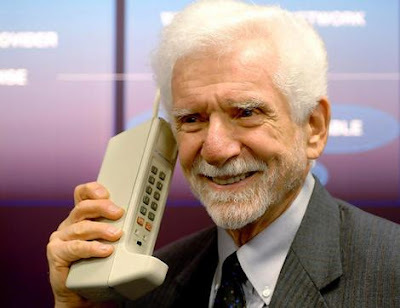 Above you can see Martin Cooper of Motorola with the Motorola DynaTAC 8000X which was originally launched in 1983. Despite the bulk, it was an incredible and liberating thing to be able to take your telephone with you; unfettered by fixed lines and cables and even by the need to connect to a car battery as with previous ‘car telephones’. At first these devices were purely telephones without wires and there were problems with battery life, signal and sound quality. The mobile phone started life as the two-way radio (or mobile rig). These were installed in vehicles e.g. taxi cabs, police cars and ambulances, although were not strictly ‘mobile phones’ as they weren’t normally connected to a phone ‘network’. Although the earliest ‘mobile’ phones were installed permanently in vehicles, later versions, e.g. the transportables (or bag phones) could also be carried and used as mobile or as portable two-way radios. The earliest true mobile telephones were dubbed ‘first generation’ mobile telephones, also called 1G. These devices were also called cellular mobile radio telephones, and were based on analogue signals. Second generation (2G) mobile telephones were introduced in the 1990s. 2G mobile phone systems were different because of their use of digital circuit switched transmission and the introduction of advanced mobile phone to network signaling. The birth of 2G systems saw telephones move from bulky 1G telephones to smaller hand-held items, which were much more portable. This change was made possible through technological developments including more advanced batteries and energy-saving electronics. 2G phones offered text messaging, initially on GSM networks and eventually on most digital networks. The very first machine-sent SMS text message was sent in 1991 in the UK. The first person-to-person text message was sent in 1993 in Finland. SMS messaging has become the communication method of choice for millions and many people now prefer sending SMS messages to placing voice calls. The invention of 3G (third generation) technologies permitted network operators (e.g. Vodafone) to offer their users a wider range of more advanced services. These included video calls and wireless internet. Handsets with larger screens (first mono then colour) were launched to handle these new functionalities. 3G networks enable network operators to offer users a wider range of more advanced services while achieving greater network capacity through improved spectral efficiency. Services include wide-area wireless voice telephone, video calls and broadband wireless data, all in a mobile environment. 3G networks are basically wide-area cellular telephone networks that evolved to incorporate high-speed Internet access and video telephony. Ever since the birth of 3G mobile phone technology, people have been talking about 4G. This technology will point to the future of mobile phones, creating the most advanced handsets and services yet. Services to be developed include live streaming of radio and TV programmes to 3G handsets with content owners including Disney recently announcing that they’ll be offering these services. The iPhone, with its touch-screen functionality, has changed the game and set a new standard. Apple’s iPhone is an internet-connected multimedia Smartphone. Since its minimal hardware interface lacks a physical keyboard, the multi-touch screen provides a ‘virtual keyboard’ when necessary. The iPhone functions as a camera phone (also including text messaging and visual voicemail), a portable media player (equivalent to an iPod), and provides Internet connectivity (with email, web browsing, and local Wi-Fi). Apple announced the iPhone on January 9, 2007, after months of rumors and speculation. The iPhone was introduced in the US on June 29, 2007 before being marketed worldwide. Time magazine named it the “Invention of the Year” in 2007. So where will the development of mobile telephony end? Of course it won’t; so maybe we should ask instead: in what direction should it go? And what are the implications for marketers? Today, more and more people are performing a wide range of daily functionalities through their mobile phones. In major parts of Asia and Africa mobile phones have completely replaced landlines as the major form of communications, since they require less infrastructure investment and are cheaper to operate. In Scandinavia and Eastern Europe parking your car involves paying for the meter via a mobile phone. In Israel there are more mobile phones than people and in addition to texting and calling, people are using their mobiles to shop, search, pay, play as well as communicate with the rest of the world. Mobile applications will take another major step forward with the recent introduction by Google of the Android mobile operating system. Open source functionalities will open the market up, in the same way that open source programming did a few years back for Content Management Systems, Design and programming functionalities. The inevitable proliferation of widgets, tools, functionalities and channels will drive the market for new and better handsets. – in many parts of the world and in many consumer segments, the mobile is a status symbol which says something about the owner. Young people often define themselves by their Mobile brand and its (interchangeable) cover. The jury is out on how small handsets can (and should) be; there is a trade-off between functionality and size/weight. Full ‘Qwerty’ keyboards, predictive text, touch screen, flip up lids? Business or gaming? Individual consumers also have specific priorities/ requirements. – voice, text, camera and mobile internet. Coming soon: video/ movies. Also QR (quick response) or 2D codes (on printed items e.g. magazines, flyers, posters, even buildings) will allow us to click on the code (i.e. scan it using the phone’s camera) and go straight to a mobile website (this technique is already widespread in Japan and S. Korea). For marketers, Mobile devices present new opportunities and challenges. The mobile device is ‘always on’ (albeit sometimes on silent) , and most of us carry it with us throughout our waking hours. We can receive calls, voicemail messages, SMSs, emails, Facebook updates and Twitter streams. It is a very personal device; it is shared with no-one and we normally access it “in private”. It is even more interactive than our PC (voice is a powerful functionality!). On the downside, screen and keyboard size are limited. UK Mobile Ad Spending doubled in 2008 (IAB = UK Interactive Advertising Bureau). This has big implications for the media industries in general, and advertising in particular. The recent big growth opportunity in advertising has been ‘online’ i.e. internet advertising (which now accounts for about 10% of the total global ad spending) and which has recently been gaining share at the expense of traditional mass media ad spend, with TV and magazines hard hit and newspapers really struggling. Let’s remember though that mobile is still only a tiny sliver of all interactive ads and represented only about 1% of the total global ad spend last year. We can expect the national mobile ad spending numbers in advanced European mobile markets to echo UK numbers (Spain, Italy, Finland, Sweden, Austria, Ireland etc) and the other European markets (Germany, France, Switzerland, Poland etc) to follow a little later. There are markets where mobile advertising is far more advanced than in the UK both in the types of ads, as well as in the proportion of the national ad spend. Japan and South Korea are clear global leaders here; Spain is well ahead of the UK as Europe’s most advanced mobile advertising market. There are also ‘unlikely’ countries where the proportion of national ad spending on mobile is far ahead of that in the US and UK – India for example. In India the reach of internet based interactive ads is very limited, so from very early on, the Indian ad industry has reached for the mobile as an interactive channel; India has been very successful in developing advergames for mobile. Nokia has famously dubbed the mobile phone “the fourth screen”. Should content providers and advertisers seek to replicate the internet experience we have at our desks for mobile users? I suggest not. After all, why do we still go to the movies? Big screen, great sound. Great all-round experience (better 3D and tactile sensations may be next). We don’t, in general, eat our dinner in the cinema and we can’t pause the movie to go to the bathroom. Equally, our laptop can go with us on the train or to a client’s office. I suggest for the foreseeable future, there will be distinct roles for Cinema, TV, PC/laptop and cellphone. In the future, these devices will no longer be called ‘cellphones’; they will be ‘handhelds’ or even ‘communicators’ (well it was good enough for Captain Kirk). Of course they are already computers; indeed today’s high-end Smartphone can surpass the performance of a mid-range laptop computer of only 5 years ago. 4G networks promise ubiquitous fast mobile broadband connections, opening up all kinds of new mobile experiences. So let’s not force mobile into a box labelled ‘mobile internet’. Mobile is different and should be approached differently: used for what it is good at. On a small screen, people don’t want to read large amounts of text and, for my money, they won’t want to watch movies. Quick clips and small chunks of text: news headlines, weather forecasts, sports scores and pop videos being typical items. And let’s not forget LOCATION. By definition, these devices are used on the move; location dependent content is highly relevant. Advertising on mobiles should also be different from TV or PC-web: consider the user experience and situation and don’t ask people to do anything fiddly or requiring a lot of reading; a short mini-clip or an ‘awareness banner’ with a single click response is about the limit. Mobile is good at short messages- chunks of content. ‘Click to call’ is very powerful. So is anything dependent on location (where are my friends? The nearest restaurant? Subway station?). Mobile is great at some things and less good at others; as marketers we need to understand this and work with it. There is room in most people’s lives for a range of screen sizes; we expect something different from each. After all, if mobile devices could do everything, we wouldn’t need laptops. Or cinemas. In many ways the mobile phone is miraculous. However: (and you may call me a dinosaur if you wish) I’m not planning to watch Coraline on my iPhone any day soon; thanks anyway (and that’s not just because the 3D glasses would be a pain to carry around with me). Hmm before I got my ipod touch, I’d have agreed with you about small screens, but I load it up with ted talks and podcasts, and I find it big enough and clear enough that even with 50-year-old eyes I can see it quite well. I hardly watch television and I rarely go to the cinema, and so my best chance of catching *anything* is on my ipod during my journeys to central London or on my laptop. I foresee the improvement of text on smaller screens; already I have the complete works of Shakespeare and the autobiography of Benjamin Franklin on my ipod… I’d not saying I would read a book at one sitting by choice but I think for a sonnet or two or a couple of pages, it’s nice to have the option on something small and convenient. I agree that finding a connection and using the internet can be a painful experience (especially on 3 which I use for the skype facility) but mostly I download the things I want to look at to the ipod in advance of a journey, and so watch and read offline… I suppose you could still say it is part of a mobile internet, though. Great post Mike – very thorough (and you’ve made me want to go and see Coraline!). As most of us will probably know, it was widely reported that 2008 (to 09) would be ‘the year of the mobile’, with a number of forward-thinking marketers getting rather excited about the campaigns that would come out of this. There’s no doubt that, with mobile technology advancing quickly (led, obviously, by the iPhone yet followed fairly quickly by the second-rate hopefuls trying to grab a piece of the pie – ouch! ), we have seen and will see increased mobile marketing activity, but I’m unsure as to just how utilised the medium has been up til now. There’s no doubt that marketing via a mobile medium is an exciting proposition but, as discussed, there are limits as to what messages a brand can truly get across and how they do this. As a consumer with a mobile, I cannot say I’ve been subject to many mobile marketing campaigns at all – the odd text now and again and a couple of virals – but this pales into insignificance against the marketing I experience on the other ‘three screens’ individually. I cannot help but think that NMA and the like were being slightly ambitious hailing 08-09 as the year of the mobile. But then I have no doubt that the credit crunch gloom and doom has played a part in the lack of mobile marketing’s development this year. Clients are far less inclined to part with their money to try new and emerging forms of marketing, instead chosing the safe, tried and tested means they know will bring a solid return.